Oil, we use them on our day to day basis for every cooking, and some we add for salads. Oil is usually considered as fat and is liquid at room temperature. Some of them are saturated oils that are solid at room temperature. Oil can be of plant or animal origin. Cooking oil can include: ghee, olive oil, palm oil, soybean oil, canola oil, pumpkin seed oil, corn oil, sunflower oil, safflower oil, peanut oil, grape seed oil, sesame oil, rice bran oil and other vegetable oils. 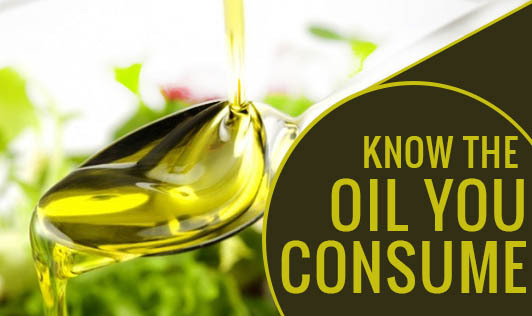 •Vegetable oil are corn, canola, sunflower, safflower, are considered as all-purpose oils. They have a neutral flavor. The high smoke point allows cooks to fry at higher temperatures without producing off flavors. The use of this kind of oil is sautéing, deep-frying, making salad dressings without dominant oil flavor. •Olive oil is of different varieties, extra virgin, virgin, extra light, and refined. We can find most of them in super markets. Extra virgin olive oil is the most common of those used. Uses of this oil vary with their variety. Olive oil is frequently used in salads. It is said to be most healthy of all the oils as it is high in mono unsaturated fat which has been shown to help reduce the risk of heart disease. You can use less expensive olive oil mixed with vegetable oil for frying. •Nut oils include walnut, hazelnut, almond, cashew oils. They have a distinctive flavor. These oils are best reserved for dressings and finishing dishes at the last minute. Refrigerate these oils can increase their shelf life; you can allow the oil to stand at room temperature until they get clear before you use. •Seed oils are sesame, coconut, and pumpkin seed. They fall under the category of multipurpose oils. Each of it has its own unique flavor. These are typically Asian cuisine oil. Sometimes sesame oil combined with other oils can be used as sauces or dressings. Coconut oil, semisolid at room temperature and high in saturated fat, is commonly used in baking. Pumpkin seed oil burns at very low temperatures; it's used at the last minute to finish sauces. Storage of oil: Oils are liquid when kept at room temperature so it is best to store oil in a dark, dry place, such as your store room. Oils such as vegetables oils are high in monounsaturated fat can be stored up to a year, while refined oil or olive oil, having the highest of monounsaturated fat, can last a few more years. The shelf life of most other oils after opened is usually six-eight months. Another important fact is to discard used oil. Never pour the oil down your kitchen sink. Oil can congeal and block pipes. The best way to discard of it is to pour it into a leak-proof container and discard it with the rest of your garbage.